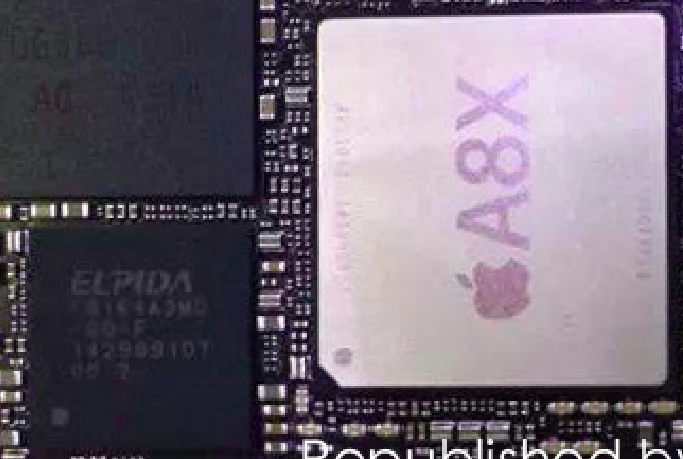 Following component leaks over the weekend purporting to show an A8X chip and Touch ID button destined for new iPads, additional photos re-published by blog apple.club.tw point to a closer look at the modified system-on-a-chip as well as what appears to be 2GB of RAM for application memory. The purported increase in RAM on the updated tablet would double that of the current generation iPad Air (and iPhone 6 for that matter) and make more more powerful multitasking on the device. Reports from the Apple supply chain have previously claimed the new tablet slated to be announced on Thursday will feature 2GB of RAM over the 1GB in the current models while other supply chain reports have mentioned the modified A8X chip (albeit in the context of the rumored 12.9-inch iPad expected next year). While Apple has resisted previously updating the RAM amount in previous devices including the iPad Air and iPhone 6 and 6 Plus, the increased app memory could be beneficial for future features including iPad multitasking previously reported by 9to5Mac. The iPad update is also expected to include Touch ID for use with Apple Pay as well as an improved display for outdoor viewing and a gold option. Apple is expected to reveal the new iPad models this week on Thursday, October 16th, at a special event held at its headquarters in Cupertino, California. 9to5Mac will bring you live coverage of the news from the event.